Elsie M. Campbell and Aunt Mimi's Quiltworks: Value of Value???? No comments about my new idea for a Value/Color workshop? Maybe I buried it too deep under my personal life stuff for quilterly people to dig for it, so let me try again. 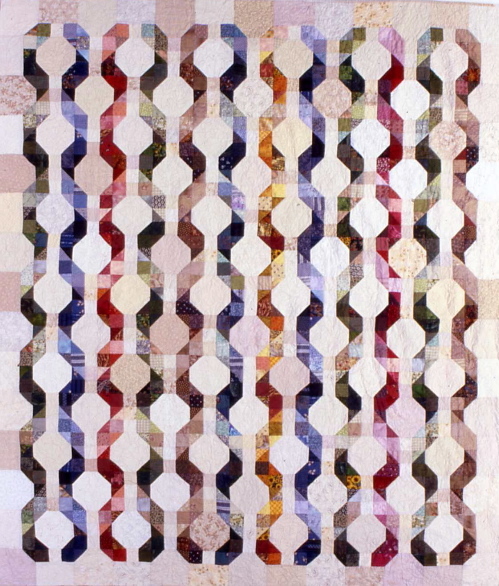 Do you struggle with finding the values in making your fabric choices for a quilt? When working with people in my classes, some of them do. Most have lots of questions when it comes to value. In my previous blog, I listed several ways that may help you discover the values of your fabrics. Take a look at them. Do you have other ideas that work for you? Please add them to mine with your comments. This is a fascinating subject to me. 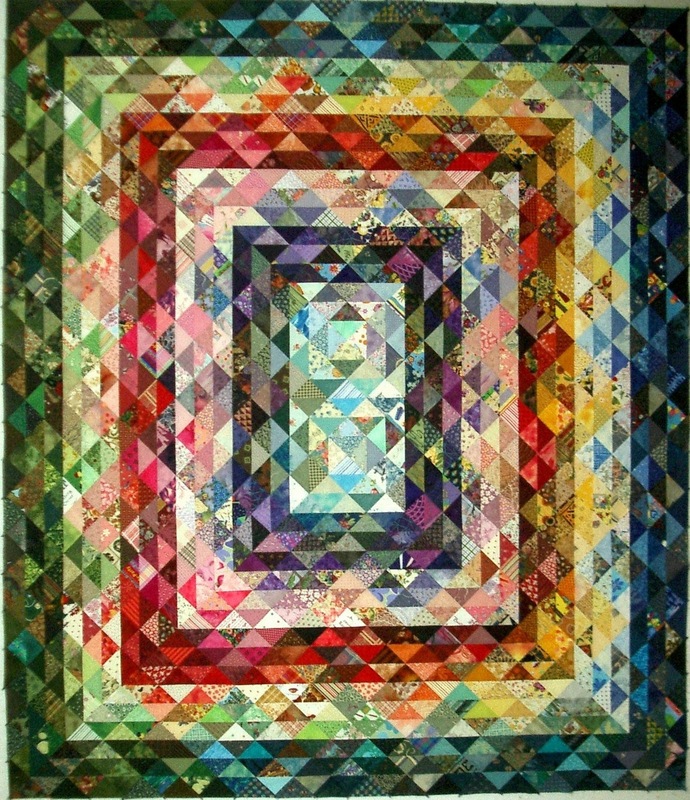 Would you enroll in and pay to take a half-day workshop about how to organize and use color and value to make a successful scrap quilt or to create the illusion of depth in your quilts? For example, I've done this with several of my quilts: Twisted Ribbons (pattern available on my website); Internet (Pattern also available) and Picket Fence (patterned in my String Quilts book). It is so much fun to play with illusions that can be created by clever use of value. 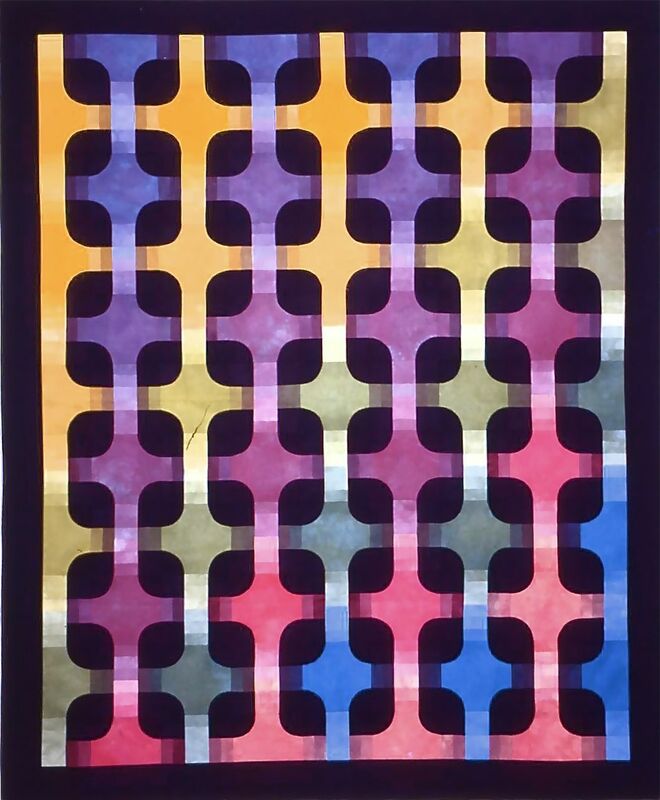 Most people seem to think it is the colors of a quilt that draw you in, but the first thing your eye perceives is not color but value (how light or dark something is) and your attention will always be drawn to the areas of highest contrast. 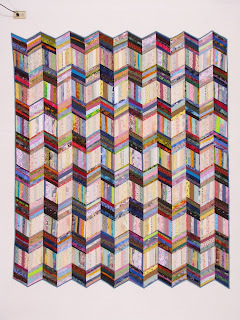 That is what first grabs you, and brings you back over and over to that one show-stopper quilt. 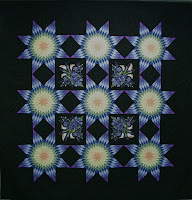 Here are a couple of more examples in Triple Trio of Stars, and one of my new book quilts, Love My Stash. Can you see what an important role VALUE plays in developing the pattern? I could easily interchange colors, as long as I kept within the same value range, and you'd still get the idea. In Love My Stash, I used a bit of every color I could find in my fabrics, but by careful value placement, I developed a pattern that is unmistakable. 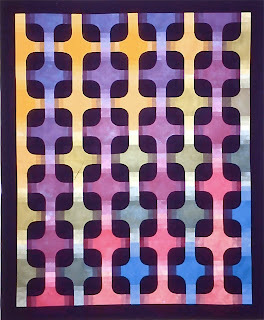 Do you enjoy working with color and value in your quilts, or do you struggle with these principles? 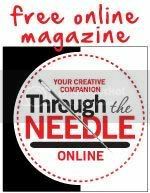 They are both so important to the visual success of your quilt. What do you think? I absolutely love working with color and value. 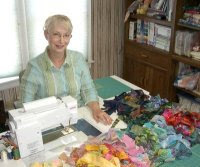 It is what I love most about quilting. I took a color theory class years ago when I was doing fine art. About half way through the class it all clicked with me. I have loved it ever since. You are absolutely right about value. It can make all the difference between a collection of great fabric and a design! I love what you have done in the examples in your blog. Thanks! But would any of you out there enroll in a workshop about Value? Google translation of Martha's comment: I love the idea of learning about color values to make a beautiful combinations using many of the pieces that I have so that I have some beautiful and harmonious quilts. yes, there are some who would sign up for a class on value. It is what makes a quilt grab you isn't it? I would take the class. I did photocopy my fabrics yesterday for a quilt, and threw out one of the fabrics based on my black and whites. Great idea. Would you submit my name to your guild's program chairperson or quilt shop owner for consideration? I travel and teach/lecture on this topic and more. I am working on a Radiant Beauty quilt, pattern by Marci Baker. I used a black print, and fussy-cut the central star, then came off that, with deep red/fuchsia hexagon prints. Next, will be deep orchid/red purple, then black and purple stars. 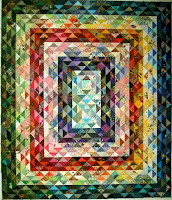 I want a color wheel effect, with the stars echoing the colors and fabrics I use for the hexagons. It is a bigger undertaking, than I originally imagined. After taking out the second row of hexagons, twice, I realized that color was not the issue, value was. I have not had any formal training, other than an adult education basic patchwork class, years ago, and realize a class in color theory would go a long way toward ending all of those "false starts and rejects." I teach a half-day workshop about value, and also can present a lecture/trunk show on the same subject. 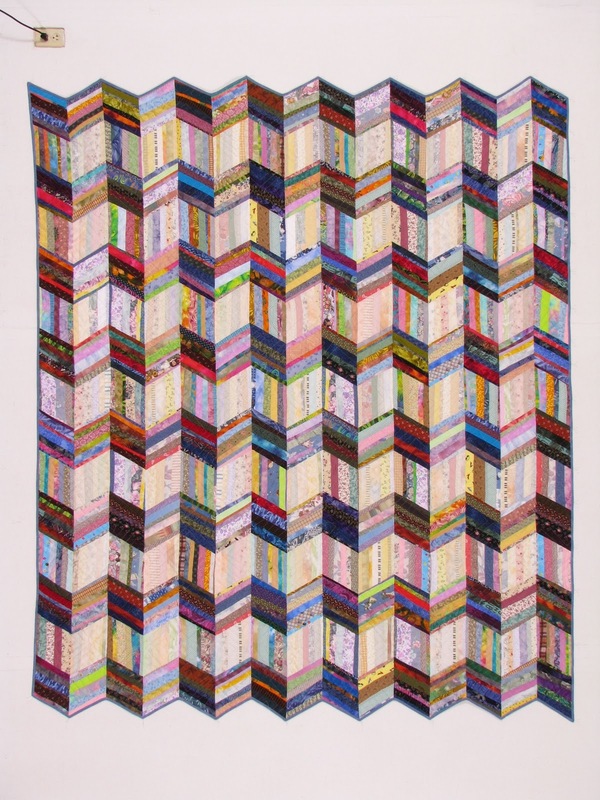 Are you a member of a guild or have a local quilt shop that would like to have me do something like this for them? Please submit my name to the program chairman or quilt shop owner for consideration. It's 8 years too late to take your class? 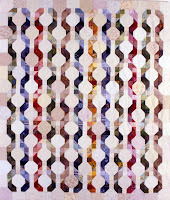 Wondering where I might find the pattern for the Picket Fence Quilt?